A fleet of Klingon ships appears at DS9, motives unclear. Sisko’s not sure what to do, so he asks Starfleet to let him borrow our old buddy Worf to figure out what the Sto-Vo-Kor is up. Worf has been on extended leave since Will Riker got the Enterprise-D destroyed and is now considering leaving Starfleet. On the station, he learns that the Klingons are planning to invade Cardassia because they think the civilian leaders who have taken over Cardassia — after the fall of the Obsidian Order — are actually Changelings. Starfleet won’t back the invasion, so Chancellor Gowron (Robert O’Reilly) ends the alliance between the two powers and asks Worf to join him. Worf refuses — setting himself up to be a pariah again — and Sisko works with Gul Dukat to save the Cardassian leaders. 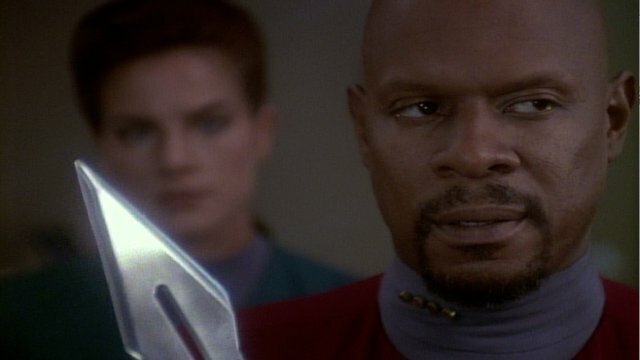 Sisko gets the Cardassians to DS9, but a large Klingon fleet attacks, only to be met with upgraded station weapons Starfleet set up in anticipation of a Dominion attack. A crazy battle ensues, but Sisko and Worf eventually convince Gowron to back off. Unfortunately, the Klingons were able to seize several Cardassian colonies, making them bigger players in the region. 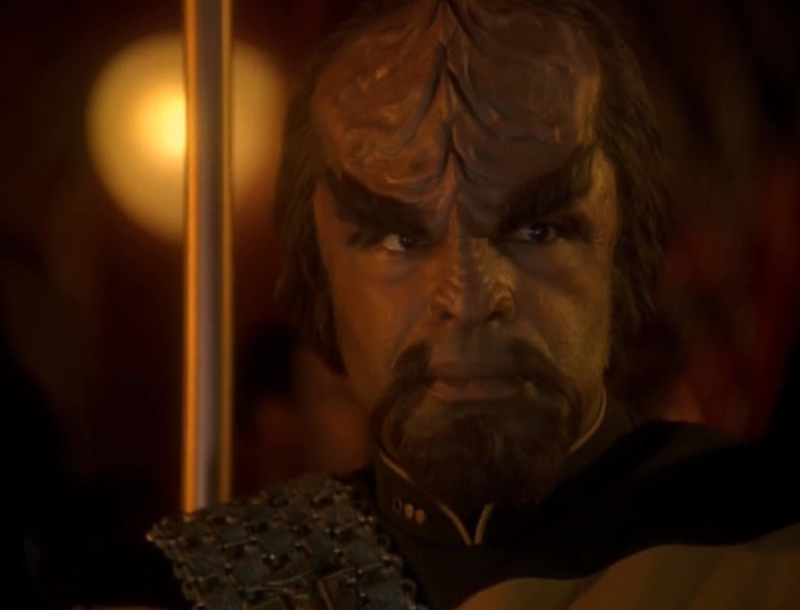 Worf, without a ship or empire to return to, decides to stay on the station, as the new strategic operations officer. Oh, and DS9 isn’t going anywhere, or something. Well, let’s see. A few things happened in this episode, didn’t they? 1) The Klingons start a war with the Cardassians and become entrenched in the area. The war further destabilizes a faltering Cardassia. 2) The Federation-Klingon alliance — which was in place for more than two decades, possibly more — ends. And it sets up conflict between the two powers. 3) The Dominion threat is further shown, especially in the way the threat of Changeling infiltrators has caused paranoia in the Alpha Quadrant. While the Cardassian leaders are found to be the genuine articles — at least, as far as the blood test thing goes — we learn later that one of the key Klingon leaders behind the invasion is actually a Changeling. 4) We see that DS9 is no longer just a key strategic outpost. It’s a FORTIFIED battle station able to defend itself against dozens of ships. Given the crumbling station the Federation inherited back in “Emissary”, the evolution is significant. It’s also somewhat hard to swallow given some comments we heard in “The Search” about the difficulty in defending the station, given its power supply and stationary nature. But, it’s nice to know that Sisko has more to repel an attack than the Defiant and three runabouts. 5) And, of course, there’s the addition of Worf. Worf’s presence on DS9 in this episode is important, but his actions there in the seventh season change the fate of the entire empire and really, the Alpha Quadrant and maybe more. We’ll discuss that in later reviews. The battle at the end of the episode was one of DS9’s high points, but it also is kind of odd. The station’s torpedoes were capable of destroying entire Birds of Prey with one shot! That runs counter to everything we’ve seen in previous Trek, when ships could usually take a hit or two before the shields went down. Also, where the hell is Starfleet security chief Michael Eddington in this episode? I’m guessing the guest budget was at its limit, but not having Eddington around (or even hearing his name, which would have been pretty easy to work in during the battle) when the Klingons board the station doesn’t make a ton of sense. And we see Eddington in later episodes, so we know he hasn’t been transferred. This episode is a good example — though not the first — of something we see a lot of in latter DS9: It seems like getting to DS9 from just about anywhere in the Alpha Quadrant doesn’t take much time. And that really doesn’t make sense given the idea that the station was set one of Starfleet’s most remote posts. The initial marketing for DS9 was that the station was “on the edge of the final frontier”! Check that clip, people. It’s hilarious. Apparently, O’Brien and Quark were the intended stars of DS9 … ? Frankly, it’s hard to believe that Worf could have made it to the station in time to help Sisko. Before his arrival, he was at a Klingon monastery. So, either that monastery was really close to Bajor (which seems unlikely) or the Klingon fleet took forever to gather at DS9. Which begs another question: Why did the Klingons gather at DS9 in the first place? They didn’t formally ask the Federation for help, so why not simply gather (under cloak) in some place they wouldn’t be spotted on their way to Cardassia? The only explanation is the Changeling in the Klingon upper ranks stopped at DS9 purposefully to try to pull the Federation and the Empire apart. But even that doesn’t make a ton of sense. This was probably the biggest “event” in DS9’s history. Even the final episodes weren’t promoted in the way the addition of Worf and the renewed tensions with the Klingons, as seen here, were. 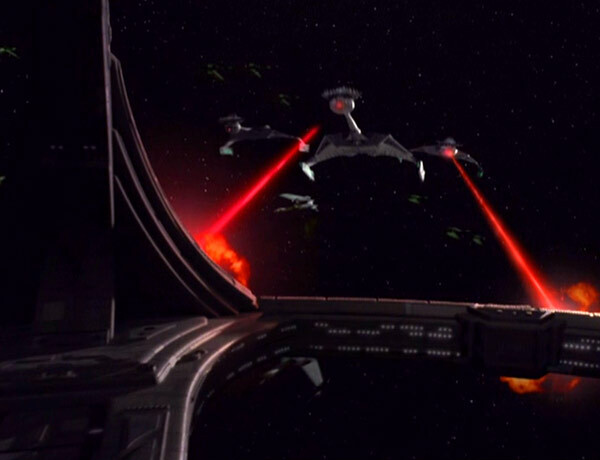 Also, this episode really set the standard for space battles — topping even “The Die is Cast”. It’s a remarkable episode as it weaves in so many characters (Dukat, Garak, Gowron) and threads from DS9’s past (or Trek’s past, in the case of Worf). Worf’s addition to the cast, as we’ll see, really worked pretty well, even if it marginalized Kira some in the fourth and fifth seasons. We learn that Admiral Cartwright from “Star Trek VI: The Undiscovered Country” is actually Sisko’s father and Leah Brahms from TNG is now a Starfleet commander. Weird, wild stuff, folks.